Samuel Paine, born about 1822, had arrived in SA by 1853. He most likely arrived with his wife and young son George on 15 August 1853 on the ship 'Gipsy'. [His obituary states that he arrived on the Gipsy in 1854, but the Gipsy did not come to SA in 1854. However a Paine family, with no initial or forenames stated, are included on the passenger list for the Gipsy's 1853 voyage to SA]. 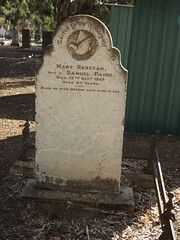 Samuel and his wife Mary/Maria Rebecca, nee Sulstone, first lived in Adelaide where their first daughter Harriet was born on 15 October 1853. •	Alexander, born 31 May 1858, died 10 October 1858, aged 4 months. •	Charles, born 12 September 1859, died 2 December 1859, aged 10 weeks. Unfortunately Mary died on 12th September 1859, presumably during childbirth. She was 37 when she died. Her infant son Charles died only 10 weeks after his mother. Samuel Paine re-married in 1863 to Laura Jane Radford, the 26 year old daughter of George Radford. They were married in the Bible Christian Chapel in Adelaide. Samuel worked as a tailor in his shop at 29 High Street for over 30 years. It was reported that 'he was a good tradesman and was consequently kept busy'. Samuel involved himself in public affairs in Willunga. In October 1855 at a public meeting he moved the motion to set up a Committee to take further action towards Willunga becoming a Parliamentary District for the Legislative Council. He reportedly had a fine singing voice and sang some excellent songs at the opening of the Oddfellows Hall in 1863. In 1875 he joined with other notable ratepayers (Thomas Atkinson, Thomas Martin, Rev E K Miller) to petition the Willunga Council to adopt a rate for the erection of a public school in Willunga. In August 1875 he was on the Committee which negotiated to buy from Mrs Pethick the land on which was established the Willunga Recreation Grounds. Later, in 1885, he signed a petition to the Council to take steps to secure the continuation of the mail run between Willunga and Port Victor. He served as sidesman at St Stephen's Church of England for a number of years from 1875-1892 and was a member of the Church's Patronage Committee in 1898. 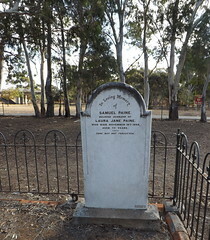 Samuel Paine died in Willunga on 18 November 1899, aged 77 years. 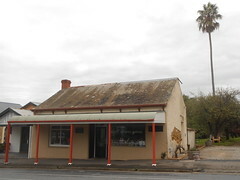 His widow Laura Jane continued to live at Willunga until her death at Parkside on 2 June 1911, aged 75 years. •	Daughter Harriett Paine married Charles Brown in February 1875, at the residence of B G Edwards in Port Lincoln. •	Daughter Caroline married James Maud Grayson in September 1880, at her father’s home in Willunga. •	Son George Paine married Kate Rielly in October 1885, at St John’s Church, Laura. Compiled by Faye Lush, 2012, revised 2019. Willunga National Trust Folder 28-8-7. Do you remember Paine, Samuel ? Then Join up and add your memory here.